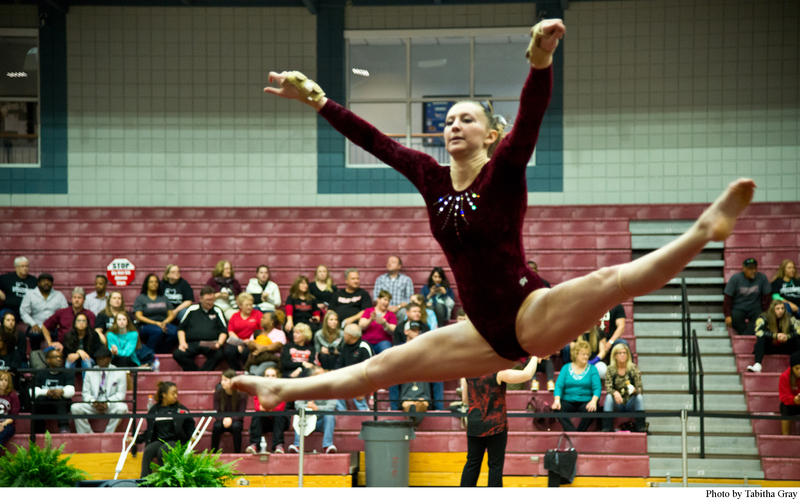 Alyssa Kelly performs her routine during the floor exercise at a recent gymnastics meet. Master of a 4-inch wide beam and swinging across uneven bars, Sophomore Communication Disorders major Alyssa Kelly pushes her fiery passion to perform towards the Pioneer Gymnastics team’s ongoing success. Originally from the state of New York, Kelly’s switch to the Lone Star State created new roots in excelling in a sport she has been a part of since the age of six. Alongside her driven passion for the mat, Kelly devotes her studies to deaf education with inspired intentions of joining the field of Audiology. “In high school, I took sign language and loved it,” Kelly exclaimed. “It relates to my family because my sister has problems with hearing, so she has been to an Audiologist her whole life.” Kelly has received the Midwest Independent Conference (MIC) scholar recognition for maintaining a 3.5 or higher GPA.